About 3 days after I had completed the Tongariro Crossing (remember that 12-mile volcanic tramp? ), a walking tour of Wellington, and various little bus-stop scenic walks, I had started to feel pain in my left leg. I couldn't quite place it – possibly a calf strain, or something with my knee, though the pain was different than what I was having earlier in the year. I was limping around quite a bit though it was bearable. On my deceptively long walk to the beach for the sunset in Barrytown, I felt a shooting pain that seriously concerned me. Clearly the Ibuprofen pills and topical gel I'd been using weren't helping much. The helicopter ride up was awe-inspiring. Fantastical. Much smoother than I expected, and not scary at all (I secured the front seat both ways!). My photos will not do the glacier justice, however I tried all the same. 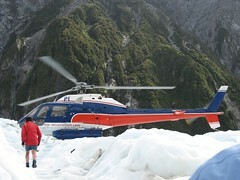 Once we landed, we put on cramp-ons and began to follow our glacier guide around. Regardless of how you get on the glacier, the hikes are all at a slow pace as the guides cut out steps and paths, and scout the terrain. Franz Joseph is 1 of only 3 glaciers in the world residing in a tropical environment. Seeing it from afar, surrounded by rainforests was surreal. Being on it, and seeing the vegetation growing along the cliff walls as waterfalls spouted hundreds of feet was amazing. The whole glacier felt alive – organically changing – drips of meltwater formed little streams which turned into waterfalls as they went down deep holes in the ice. I'm quite sure those streams turned to full flowing rivers deep down. We saw ice collapse higher up the glacier and tumble down (the hikes occur on the lower half, which moves slower, and is thus presumably safer). Awesome, Dave! Mind sharing what the cost was for the heli-ride? How much are guided hikes in general? This is DEFINITELY on my list of things to do! The heli-ride was $260 US dollars, which is 2-3 times the cost of the full day, 8-hr glacier hike (~$100 USD, 6 hours of which is actually on the ice). Regardless of which approach you take, it’s a relatively low impact hike once you’re on the glacier, though it can be slippery and I saw an older English guy slip and fall backwards in one of the ice caves. I’m sure he bruised himself good. The guides go slowly, and have to chip out steps and test the ice so you move about 10 steps, then stop and wait (over and over). The scenery is stunning! oh my gosh!!! that is soooooo totally awesome! (said like a valley girl, I know), but man….. how absolutely beautiful!! It was amazing – hard to sum up the sheer size of the blocks of ice on the glacier. The blue of the ice came out really well though! I think this site holds very excellent indited subject material content.